Students have to guess the meaning of some idioms in English. The idioms are used in sentences that serve as examples and as clues. 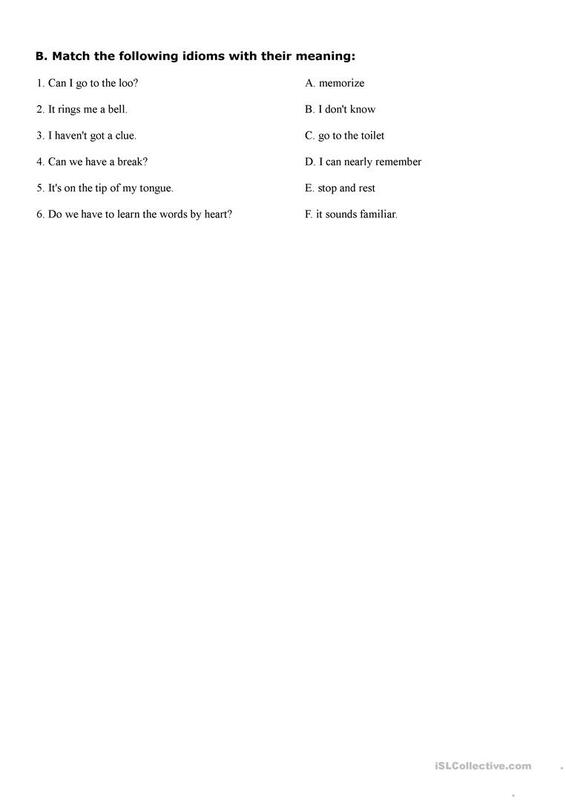 In the second activity they have to match other idioms with a synonym or definition. The above downloadable handout is a great resource for high school students at Pre-intermediate (A2) level. It is great for revising Nouns in English, and is a valuable material for developing your students' Speaking skills. It focuses on the topic and words of Idioms. Mawar00 is from/lives in and has been a member of iSLCollective since 2014-10-23 11:35:56. Mawar00 last logged in on 2019-04-12 12:10:12, and has shared 8 resources on iSLCollective so far.